Chazelles Castle from the 17th century in a park with swimming pool. The French village of Avèze, in the middle of the beautiful Auvergne countryside, is an ideal base for an active holiday. The region offers a whole range of activities for families and other groups. Whether you prefer hiking, skiing or playing golf, this magnificent traditional region of France has everything. The country estate with its own swimming pool in the village of Avèze is easy to reach and provides a convenient base for a pleasant holiday in the enchanting French countryside. Discover the Auvergne region by climbing the Puy de Sancy (1864 m), admiring the many waterfalls of the Dordogne river, visiting the adventure park Vulcania or walking the ancient pilgrim path to Orcival. The possibilities are endless. 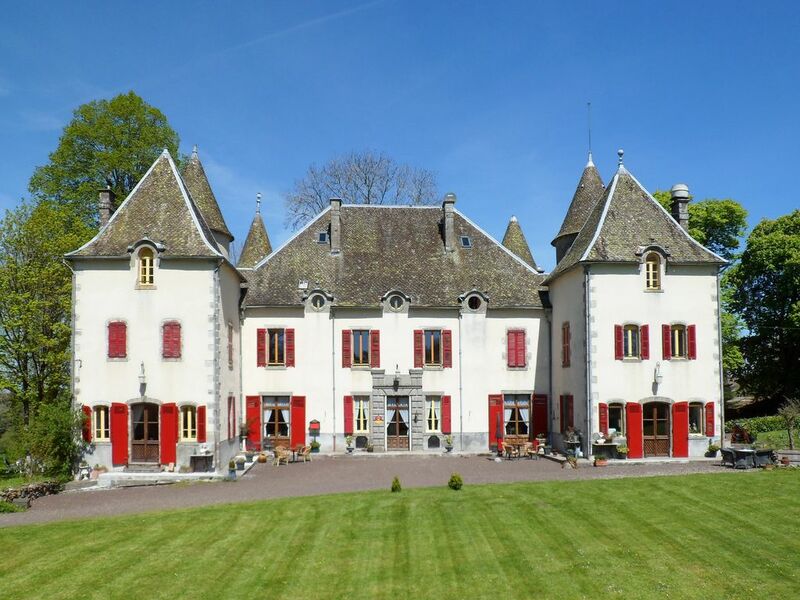 Our romantic castle from the seventeenth century is ideal for walkers, cyclists and tranquility seekers but there are nearby also many other things to be seen and done; shopping, cafes, restaurants, small museums, a casino, the Spa of La Bourboule and Le Mont Dore. An amusement park for children; Parc Fenestre. The Chateau is located 20 kilometers from the famous ski area of Le Mont Dore. You can visit Vulcania and learn more about the volcanoes, go with a train to the top of the Puy de Dôme, visit the historic village of Besse, walk along waterfalls ... too many to mention. In Tauves there is for instance a pizzeria with terrace. Bleu de AVEZE is made and sold on the farm next to us, it is a lovely soft blue cheese. We have three mountain bikes and will love to lend cycling and walking maps. Les prix mentionnées sont de location du chateau en tant que gite. C'est aussi possible de rester chez nous à la base de chambres d'hôte. Veuillez nous demander les possibilités et tarifs.